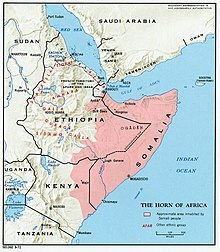 The Somalis ( Somali: Soomaalida) are an ethnic group belonging to the Cushitic peoples inhabiting the Horn of Africa. The overwhelming majority of Somalis speak the Somali language, which is part of the Cushitic branch of the Afroasiatic (formerly Hamito-Semitic) family . They are predominantly Sunni Muslim. Ethnic Somalis number around 28-30 million and are principally concentrated in Somalia (around 15 million),  Ethiopia (8.5 million),  Kenya (2.4–3 million),   and Djibouti (534,000). 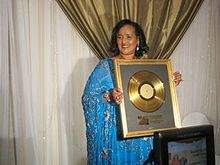 Somali diasporas are also found in parts of the Middle East, North America, Western Europe, African Great Lakes region, Southern Africa and Oceania. In the late 19th century, after the Berlin conference had ended, European empires sailed with their armies to the Horn of Africa. The imperial clouds wavering over Somalia alarmed the Dervish leaders Mohammed Abdullah Hassan and Sultan Nur Ahmed Aman, who gathered Somali soldiers from across the Horn of Africa and began one of the longest anti-colonial wars ever. The news of the incident that sparked the 21 year long Dervish rebellion according to the consul-general James Hayes Sadler was spread or as he alleged was concocted by Sultan Nur of the Habr Yunis. The incident in question was that of a group of Somali children that were converted to Christianity and adopted by the French Catholic Mission at Berbera in 1899. Whether Sultan Nur experienced the incident first hand or whether he was told of it is not clear but what is known is that he propagated the incident in June 1899, precipitating the religious rebellion that later morphed into the Somali Dervish. The Dervish movement successfully repulsed the British empire four times and forced it to retreat to the coastal region. As a result of its successes against the British, the Dervish movement received support from the Ottoman and German empires. The Turks also named Hassan Emir of the Somali nation,  and the Germans promised to officially recognise any territories the Dervishes were to acquire. After a quarter of a century of holding the British at bay, the Dervishes were finally defeated in 1920, when Britain for the first time in Africa used airplanes to bomb the Dervish capital of Taleex. As a result of this bombardment, former Dervish territories were turned into a protectorate of Britain. A referendum was held in neighboring Djibouti (then known as French Somaliland) in 1958, on the eve of Somalia's independence in 1960, to decide whether or not to join the Somali Republic or to remain with France. The referendum turned out in favour of a continued association with France, largely due to a combined yes vote by the sizable Afar ethnic group and resident Europeans. There was also widespread vote rigging, with the French expelling thousands of Somalis before the referendum reached the polls. The majority of those who voted no were Somalis who were strongly in favour of joining a united Somalia, as had been proposed by Mahmoud Harbi, Vice President of the Government Council. Harbi was killed in a plane crash two years later. Djibouti finally gained its independence from France in 1977, and Hassan Gouled Aptidon, a Somali who had campaigned for a yes vote in the referendum of 1958, eventually wound up as Djibouti's first president (1977–1991). British Somaliland became independent on 26 June 1960 as the State of Somaliland, and the Trust Territory of Somalia (the former Italian Somaliland) followed suit five days later. On 1 July 1960, the two territories united to form the Somali Republic, albeit within boundaries drawn up by Italy and Britain. A government was formed by Abdullahi Issa Mohamud and Muhammad Haji Ibrahim Egal other members of the trusteeship and protectorate governments, with Haji Bashir Ismail Yusuf as President of the Somali National Assembly, Aden Abdullah Osman Daar as the President of the Somali Republic and Abdirashid Ali Shermarke as Prime Minister (later to become President from 1967 to 1969). On 20 July 1961 and through a popular referendum, the people of Somalia ratified a new constitution, which was first drafted in 1960. In 1967, Muhammad Haji Ibrahim Egal became Prime Minister, a position to which he was appointed by Shermarke. Egal would later become the President of the autonomous Somaliland region in northwestern Somalia. Old Somali stone tablet: After Somali had lost its ancient writing script,  Somali scholars over the following centuries developed a writing system known as Wadaad writing to transcribe the language. The Somali language (Af-Somali) is a member of the Cushitic branch of the Afroasiatic family. 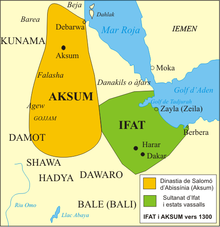 Its nearest relatives are the Afar and Saho languages. Somali is the best documented of the Cushitic languages,  with academic studies of it dating from before 1900. The exact number of speakers of Somali is unknown. One source estimates that there are 7.78 million speakers of Somali in Somalia itself and 12.65 million speakers globally. The Somali language is spoken by ethnic Somalis in Greater Somalia and the Somali diaspora. In some regions, xalwo ( halva) is a popular confection eaten during festive occasions such as Eid celebrations or wedding receptions. It is made from sugar, corn starch, cardamom powder, nutmeg powder and ghee. Peanuts are also sometimes added to enhance texture and flavor. After meals, homes are traditionally perfumed using frankincense (lubaan) or incense (cuunsi), which is prepared inside an incense burner referred to as a dabqaad. In ancient Somalia, pyramidical structures known in Somali as taalo were a popular burial style. Hundreds of these dry stone monuments are found around the country today. Houses were built of dressed stone similar to the ones in Ancient Egypt. There are also examples of courtyards and large stone walls enclosing settlements, such as the Wargaade Wall. An estimated 20,000 Somalis emigrated to the U.S. state of Minnesota some ten years ago and the Twin Cities ( Minneapolis and Saint Paul) now have the highest population of Somalis in North America. The city of Minneapolis hosts hundreds of Somali-owned and operated businesses offering a variety of products, including leather shoes, jewelry and other fashion items, halal meat, and hawala or money transfer services. Community-based video rental stores likewise carry the latest Somali films and music. The number of Somalis has especially surged in the Cedar-Riverside area of Minneapolis. Mustafa Mohamed – Somali- Swedish long-distance runner who mainly competes in the 3,000-meter steeplechase. Won gold in the 2006 Nordic Cross Country Championships and at the 1st SPAR European Team Championships in Leiria, Portugal, in 2009. Beat the 31-year-old Swedish record in 2007. ^ Joussaume, Roger (1976). 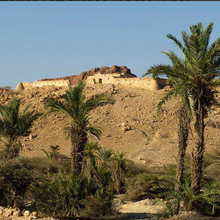 "Fouille d'un tumulus à Ganda Hassan Abdi dans les monts du Harar". Annales d'Ethiopie. 10: 25–39. doi: 10.3406/ethio.1976.1157. Retrieved 10 March 2017. ^ Maury, Carole; Lecarme, Jacqueline (January 1987). "A software tool for research in linguistics and lexicography: Application to Somali". Computers and Translation. 2 (1): 21–36. doi: 10.1007/BF01540131. ^ " Talking Point" by M. M. Afrah Minneapolis, Minnesota (USA) Aug., 12. 2004. ^ a b c d Sanchez, Juan J.; Hallenberg, Charlotte; Børsting, Claus; Hernandez, Alexis; Morling, Niels (July 2005). "High frequencies of Y chromosome lineages characterized by E3b1, DYS19-11, DYS392-12 in Somali males". European Journal of Human Genetics: EJHG. 13 (7): 856–866. doi: 10.1038/sj.ejhg.5201390. ISSN 1018-4813. PMID 15756297. ^ a b Cruciani, Fulvio; Fratta, Roberta La; Santolamazza, Piero; Sellitto, Daniele; Pascone, Roberto; Moral, Pedro; Watson, Elizabeth; Guida, Valentina; Colomb, Eliane Beraud (1 May 2004). "Phylogeographic Analysis of Haplogroup E3b (E-M215) Y Chromosomes Reveals Multiple Migratory Events Within and Out Of Africa". The American Journal of Human Genetics. 74 (5): 1014–1022. doi: 10.1086/386294. ISSN 0002-9297. PMC 1181964. PMID 15042509. ^ a b Cruciani, Fulvio; La Fratta, Roberta; Trombetta, Beniamino; Santolamazza, Piero; Sellitto, Daniele; Colomb, Eliane Beraud; Dugoujon, Jean-Michel; Crivellaro, Federica; Benincasa, Tamara (June 2007). "Tracing past human male movements in northern/eastern Africa and western Eurasia: new clues from Y-chromosomal haplogroups E-M78 and J-M12". Molecular Biology and Evolution. 24 (6): 1300–1311. doi: 10.1093/molbev/msm049. ISSN 0737-4038. PMID 17351267. ^ Hassan, Hisham Y.; Underhill, Peter A.; Cavalli-Sforza, Luca L.; Ibrahim, Muntaser E. (November 2008). "Y-chromosome variation among Sudanese: restricted gene flow, concordance with language, geography, and history". American Journal of Physical Anthropology. 137 (3): 316–323. doi: 10.1002/ajpa.20876. ISSN 1096-8644. PMID 18618658. ^ Underhill JR, Rowold DJ, Regueiro M, Caeiro B, Cinnioğlu C, Roseman C, Underhill PA, Cavalli-Sforza LL, Herrera RJ (2004). "The Levant versus the Horn of Africa: Evidence for Bidirectional Corridors of Human Migrations". American Journal of Human Genetics. 74 (3): 532–544. doi: 10.1086/382286. PMC 1182266. PMID 14973781. ^ Iacovacci, Giuseppe; D’Atanasio, Eugenia; Marini, Ornella; Coppa, Alfredo; Sellitto, Daniele; Trombetta, Beniamino; Berti, Andrea; Cruciani, Fulvio (1 March 2017). "Forensic data and microvariant sequence characterization of 27 Y-STR loci analyzed in four Eastern African countries". Forensic Science International: Genetics. 27: 123–131. doi: 10.1016/j.fsigen.2016.12.015. ISSN 1872-4973. PMID 28068531. ; 25/34 total local samples belonged to haplogroup T (24/24 Dir, 1/1 Hawiye, 0/9 Isaak). ^ Cabrera, Vicente M.; Abu-Amero, Khaled K.; Larruga, José M.; González, Ana M. (2010). "The Arabian peninsula: Gate for Human Migrations Out of Africa or Cul-de-Sac? A Mitochondrial DNA Phylogeographic Perspective". The Evolution of Human Populations in Arabia. Vertebrate Paleobiology and Paleoanthropology. Springer, Dordrecht. pp. 79–87. doi: 10.1007/978-90-481-2719-1_6. ISBN 978-90-481-2718-4. ^ Malyarchuk, Boris A.; Gilles, A; Bouzaid, E; Kefi, R; Paris, F; Gayraud, RP; Spadoni, JL; El-Chenawi, F; Béraud-Colomb, E (2008). "Mitochondrial DNA Sequence Diversity in a Sedentary Population from Egypt". Annals of Human Genetics. 68 (Pt 1): 23–39. doi: 10.1046/j.1529-8817.2003.00057.x. PMID 14748828. ^ Malyarchuk, Boris A.; Derenko, Miroslava; Perkova, M; Grzybowski, T; Vanecek, T; Lazur, J (2008). "Reconstructing the phylogeny of African mitochondrial DNA lineages in Slavs". European Journal of Human Genetics. 16 (9): 1091–1096. doi: 10.1038/ejhg.2008.70. PMID 18398433. ^ Gonzalez; et al. (2007). "Mitochondrial lineage M1 traces an early human backflow to Africa". BMC Genomics. 8: 223. doi: 10.1186/1471-2164-8-223. PMC 1945034. PMID 17620140. ^ Hodgson, Jason A.; Mulligan, Connie J.; Al-Meeri, Ali; Raaum, Ryan L. (12 June 2014). "Early Back-to-Africa Migration into the Horn of Africa". PLOS Genetics. 10 (6): e1004393. doi: 10.1371/journal.pgen.1004393. ISSN 1553-7404. PMC 4055572. PMID 24921250.